Charles M. Schulz's PEANUTS comic strip has long been a cornerstone of American Pop Culture. The glimpses into the lives of Charlie Brown and friends have resonated with audiences for decades and now BOOM! Studios is publishing a celebration of the comic strip for the 65th anniversary of its publication. The contributing artists are being leaked out to the press slowly but surely. I have two deep connections with PEANUTS. The first is an undying love of Snoopy, especially in his WWI Ace persona. Snoopy's battles against the Red Baron entertained me throughout my childhood. As odd as it might sound, I think I became interested in War Games featuring battles between Sopwith Camels and Fokker Dr. 1 aircraft because of the battles I imagined. If someone published a Snoopy vs. the Red Baron set for Wings of War, I'd rush out to buy it. My second connection, is my wife Jody Lindke. Jody has a passion for illustration and cartooning. She has been a cartoonist for longer than I've known her, and she was my favorite cartoonist in the school paper long before we met. I loved her NICNUP cartoon strip in our college paper, a strip that merged BLOOM COUNTY with PEANUTS to wonderful effect. Like PEANUTS, there was an underlying sadness to many of Jody's jokes. Her Bambi strip hits the same ironic sweet spot for me as Lucy holding the football for Charlie Brown. My wife is a generally cheerful person, though her humor can run sorrowful, but there are three occasions when I've seen Jody's joy light up an entire room. The most recent was when we were able to bring our twin daughters home from the hospital. She glowed the entire trip home. Then there's our wedding day, when we received just enough rain for it to be lucky, saw small birds being born, and witnessed a double rainbow. I'm not kidding. We saw a double rainbow. This is not a reference to the meme. I'm happy to have been partly responsible for these moments where I got to see her filled with love and joy. 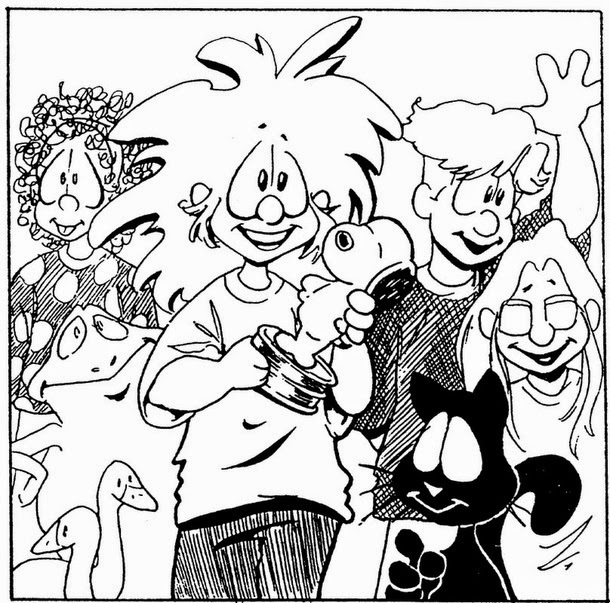 But the most vivid combination of happiness and pride I've ever seen from Jody was when she was receiving the Charles M. Schulz college cartooning award. Jody was the first woman to receive the award. It was an accomplishment that was solely her own. As is often the case, I felt lucky to be in the same room with Jody. After years of hard work and meeting deadlines. After years of using the meager payments from the school paper and local papers to pay her rent and food bills, her work was being acknowledged by people she admired. Snoopy sparked my imagination when I read his adventures in print, but Snoopy handed Jody her award and that was something truly magical to behold. Because of these two deep emotional connections, I'll be rushing out to buy the book this September. Addendum: Jody is not a part of the Tribute, but we are very excited for everyone who is. There are some great artists participating who have been announced so far.